Top Level Hosting Review 2019: Is Top Level Hosting a Good Hosting? For affordable Romanian hosting on superb infrastructure, Top Level Hosting is a very attractive option with a good selection of web hosting, VPS, and dedicated server packages. Web designers and developers could even take advantage of their free web hosting offer. Established in 2009, Top Level Hosting (TLH) aims to provide professional, affordable hosting for customers in Romania and Europe. With two high-end Romanian data centers in Bucharest and Pitesti they provide inexpensive hosting packages featuring fantastic performance, security, and availability. Their catalog includes web hosting, VPS, and dedicated servers as well as colocated servers. TLH’s servers run on HP Proliant DL-120 G7 and DL-380 G7 servers with ECC RAM and Intel Xeon Quad Core processors, backed up by R1Soft backups and pure SSD storage with RAID 10 redundancy. Even their web hosting provides great performance with 1 GB of RAM and 1 CPU core for everyone. Thanks to multiple ISPs, the infrastructure includes high-capacity networks that enable TLH to provide 4 Gbps connections at all times. They also make use of Cisco network infrastructure and other top network connectivity providers for global reach. Although their hosting products are a bit more minimalist, with only the essentials included out of the box, you can install pretty much anything else you want thanks to cPanel and Softaculous. Web hosting products (but not VPS or dedicated server products) come with 30-day refund policy. They also offer a free web hosting plan for website designers and developers. If this sounds too good to be true, it almost is, because TLH have to review your request for your already-complete website before they give you your freebie. TLH don’t display any ads, their website migration services are free, and they will recommend your services to clients. 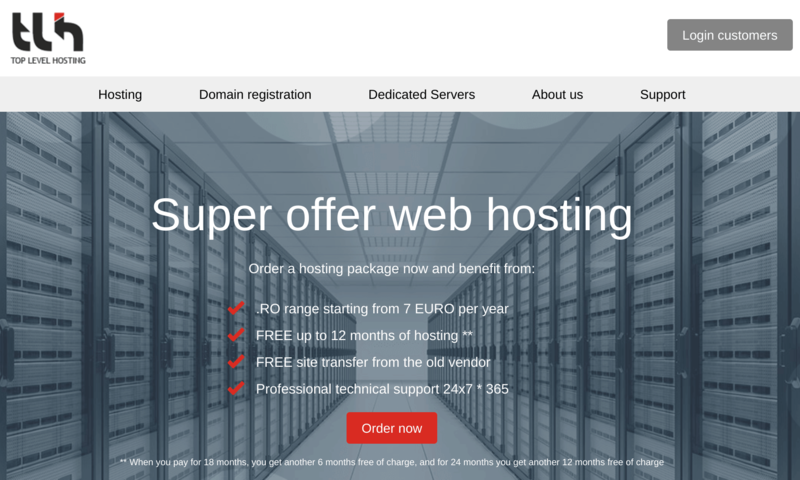 You get 1 GB of storage, email hosting, discounts on .ro domains, and a range of billing options. Web Hosting products come with unlimited bandwidth, FTP accounts, and subdomains as well as 1 CPU core and 1 GB RAM. There are five plans that offer 2, 6, 10, 25, or 50 GB of SSD storage and 1, 4, 10, 20, or 40 domains. A dedicated IP or SSH can be added for a monthly fee but comes for free with the two top plans, and the top plans also provide unlimited email accounts and databases. Reseller Hosting plans come with unlimited traffic, domains, email accounts, subdomains, and databases. The only difference between the plans is the 15, 30, 60, or 120 GB of storage. Dedicated Servers range from a single Quad Core to two Six-Core CPUs. You can also choose between 16, 32, or 128 GB of ECC RAM. A single IP address is provided, but you can purchase additional IPs as well as cPanel/WHM and R1Soft backups. The TLH ticketing system allows you to access technical support on a 24/7 basis. Live chat and phone support can be summoned only on weekdays between 10 am and 8 pm. The knowledge base is decent but not comprehensive. Top Level Hosting provides top-notch products and services at rock-bottom prices. The limited live chat and phone support hours seem to be the only area of compromise. Wondering how Top Level Hosting stacks up against other Web Hosting companies? Enter any other Web Hosting company and we will give you a side-by-side comparison.